This week I've been preparing my usual Thanksgiving turkey feast, and being thankful that I'm getting out of the UK. It gives me no pleasure to say this. I love the UK, I've made my home here for many years, and I wish it well; but the news on Brexit looks worse with every passing day. It's becoming increasingly apparent the government has no plan, no grip, no strategy, and no prospect of locating any of them using both hands and a map. It doesn't understand the technical complexities of Brexit, and doesn't want to. It deals with inconvenient facts by pretending they don't exist. Meanwhile the clock ticks inexorably on, and the hour of Brexit draws ever closer. If the great British public understood the consequences of their government's foolishness, I think there would be riots in the streets. Brexit is a massive and costly challenge at best; in this government's careless hands, it will make the poll tax look like a birthday party. 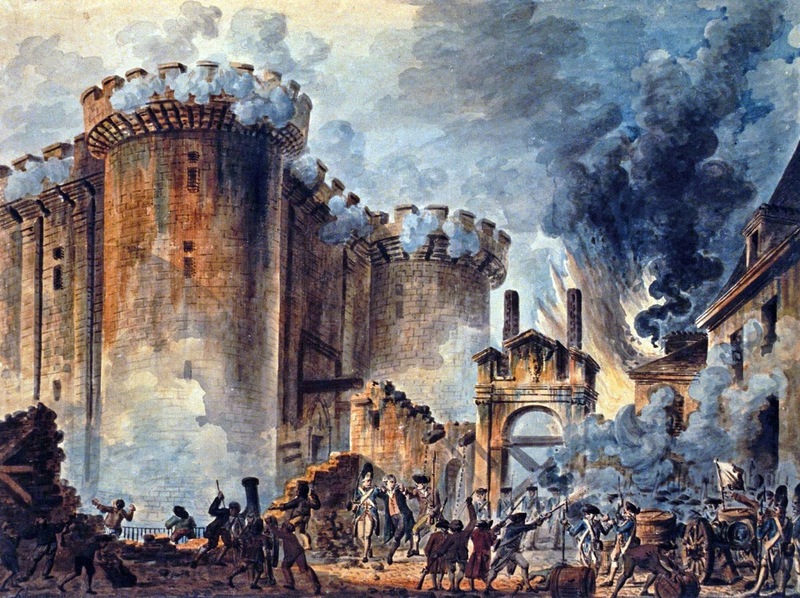 Storming of the Bastille, 1789. For now, we're still in the calm before the storm. Unemployment is low, the economy is growing, and cuts to public services have not yet brought public anger to a breaking point. Legally speaking, the UK is still a member of the EU and most consequences of Brexit lie in the future. In the Guardian, Rafael Behr argues persuasively that the public has grown numb after the last few years of political turmoil; the details of parliamentary amendments and negotiations in Brussels are of interest only to a small minority. One day soon, reality is going to bite. I'm not the only one who has taken notice; this week, the University of Warwick warned its EU staff may soon choose to leave. Many of us who can leave are preparing to do so. I am very worried for those who will stay. The government doesn't care. It dances in a bubble of delusion, nurtured by the anti-European press, consuming its attention with petty internal squabbles. It feels like the royal court at Versailles, competing for the favour of Marie Antoinette, obsessed with meaningless games of status, comparing jewels and finery, right up until the moment the revolutionary mob kicks in the gates. For many centuries, British pragmatism, stubbornness and good fortune have forestalled a revolution. There is no national memory of what a revolution means. I really fear there could be a breakdown of civil order once the consequences of Brexit take hold. We are already close to a breakdown of the rule of law. Our craven government does its best to ignore Parliamentary votes, and looks upon a complex network of legal and treaty obligations with all the comprehension of a chimpanzee playing with an iPhone. Maybe Britain will sleepwalk into a revolution, with all the savagery and destruction that entails. Maybe it will quietly wither into a smaller, poorer, frightened shadow of its former self. I will watch from a distance, and be thankful.